La Maldita Vecindad y los Hijos del Quinto Patio (English: The Damned Neighborhood and the sons of the fifth Patio usually called only "La Maldita") are a band formed in Mexico City in 1985. 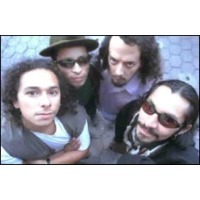 They are pioneers in rock en Español and are one of the most influential rock bands in Latin America. They first made an impact with "Mojado", "Un poco de sangre", "Cocodrilo", "Pachuco" and "Un Gran Circo," which narrates the problems, adventures, and beauty of a society anxious to improve its economic status. Their wardrobe has incorporated elements of the Pachuco, an archetypical character represented by Tin Tán in the Mexican cinema. Tin Tan is sampled in one of the group's biggest hit, 1991's Pachuco. The last studio album recorded was in 1998. Since then, the band has collaborated with other bands, as well as having participated in tribute albums like the tributes for José José and Tigres del Norte. Their sound incorporates many styles, including Ska, Rock, and traditional Cuban forms such as the bolero and Cuban Son. Roco, the band's vocalist, dresses in a manner reminiscent of the Pachucos.